"On a scorching July night in 1983, a group of teenagers goes camping in the forest. Bright and brilliant, they are destined for great things, and the youngest of the group—Aurora Jackson—is delighted to be allowed to tag along. The evening starts like any other—they drink, they dance, they fight, they kiss. Some of them slip off into the woods in pairs, others are left jealous and heartbroken. But by morning, Aurora has disappeared. Her friends claim that she was safe the last time they saw her, right before she went to sleep. An exhaustive investigation is launched, but no trace of the teenager is ever found. Thirty years later, Aurora’s body is unearthed in a hideaway that only the six friends knew about, and Jonah Sheens is put in charge of solving the long-cold case. Back in 1983, as a young cop in their small town, he had known the teenagers—including Aurora—personally, even before taking part in the search. Now he’s determined to finally get to the truth of what happened that night. Sheens’s investigation brings the members of the camping party back to the forest, where they will be confronted once again with the events that left one of them dead, and all of them profoundly changed forever." 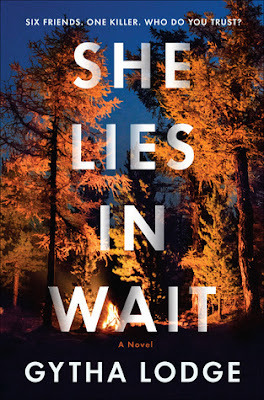 She Lies in Wait was one of my most anticipated mysteries of 2019! I read that summary and just knew that I had to get my hands on this book as soon as possible. There is just something that I can't get enough of about books that feature unsolved mysteries and investigations in the present. There are one of my readerly catnips I guess you could say (I'm well aware that's not really a thing but it fits). And because of all of this, I just immersed myself within the pages of this book. I think I said this on Instagram when I was talking about this book but it is a book where the tension and suspense slowly build page by page. The author did a really great job of keeping me guessing throughout the book. There were times that I thought I had it figured out only to realize a couple of chapters later that I was no longer sure. And this takes some talent in my opinion because there are a limited number of suspects considering the setup of the book which has Aurora disappearing after going camping with her sister and five of her sister's friends. I honestly just let the author take me on a ride with this book and enjoyed every minute of it! I also really enjoyed that in this book there are two separate storylines that the book flips between. One is the present investigation which is being conducted by Jonah Sheen and his team of officers. The second storyline is pieces of what actually happened the night Aurora went missing. The author ties these two storylines together beautifully and in a way that left me eager to read more! I'm so excited that this is the beginning of a new mystery series because I can't wait to read more books featuring Jonah Sheen! Overall, I enjoyed my time with this book immensely and can't say enough good things about it! It's an atmospheric read that kept me guessing the entire time. It's one that I didn't rush through but just enjoyed throughout. I will be looking forward to the next book in this series for sure! If you are a mystery lover like I am, then I can recommend this one without hesitation. I did see a review somewhere that complained that it was a bit on the slower side - but I would disagree there. I think if you are expecting a thriller then sure, I could see that. But this is a mystery and I felt like the author did a beautiful job with the pacing. She wrapped me up in both storylines with ease until I just had to see how it would all end. Highly recommended on my side of things! Bottom Line: A suspenseful mystery that kept me guessing and turning the pages! First of all, I think 'readerly catnip' is definitely a thing. I completely understand. Ha! Glad to hear you liked this one so well. I'll probably get to it later this spring. I had not heard that it is the first book in a series and so that's a fun thing too. Nice review, Sam! I'm with Kay. I think you are onto something with "readerly catnip". It makes sense to me! I have a hard time resisting long buried secrets and cold cases too. This sounds good, and I'm glad you enjoyed it. Readerly catnip is definitely a thing! And cold cases is a big one of mine! This sounds like a good read. I've been really enjoying mysteries lately so I'm adding this to my TBR.